A different and unique route through Seville. With Past View Sevilla you travel the main points of the city by a very special way: traveling to the past. 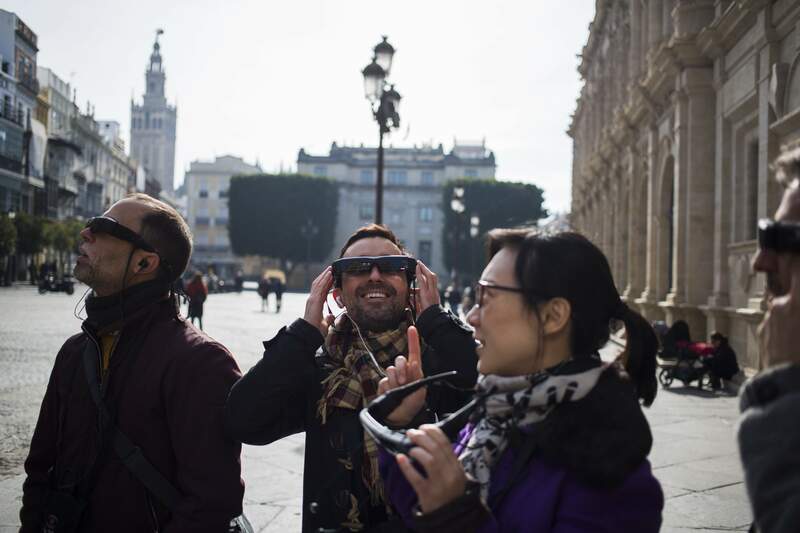 The tour shows you several historical periods of the city: the Roman Hispalis, the Isbiliya Almohade, the Seville of Cervantes and Murillo … and the 21st century. At each stop called “Virtual Recreation” we will move to a time when a historical character will accompany you by showing you the buildings, how their people lived, their customs or their clothes. These points are complemented by additional content that will provide you with more information in a didactic and enjoyable way. In addition, the videoguided of the city will bring you closer to other cultural, historical and artistic aspects of the city of Seville. And always accompanied by our assistants. Reduced price for those over 65, children 9 to 12 years old, unemployed (previous accreditation with official document) and groups from 10 people. Discounts for groups valid only on reservation. DURATION OF THE ROUTE: The Past View Sevilla route lasts approximately 2 hours. ROUTE: The stops on the Past View Sevilla route are: Las Setas de Sevilla; Plaza del Salvador; Plaza de San Francisco; Catedral – Puerta del Perdón; Giralda; Real Alcázar; Archivo de Indias; Guadalquivir – Torre del Oro. If you have booked in advance the Past View Seville service will have to be 15 minutes before the start of the route. If your reservation has not been made, you can participate in the route as long as there are places available. Users will be accompanied by an official assistant of Past View with historical, cultural and technical knowledge to solve any doubt or problem that may arise during the Past View Sevillaroute.